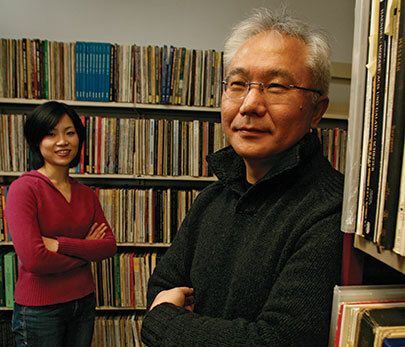 Professor Ichiro Fujinaga and PhD student Catherine Lai explore ways to digitize and retrieve analog recordings. In the era of the digital download, when ghostly MP3s float freely from computer to cellphone, and the collected works of ABBA and Zappa can slip comfortably into a shirt pocket, it’s easy to forget that music recordings were once inextricably tied to physical objects. From 78 RPM shellac discs to long-playing vinyl albums (LPs), the 20th century produced at least a million discrete analog phonograph records. The Schulich School of Music’s Distributed Digital Music Archives and Libraries (DDMAL) research program is developing the technology to digitally preserve the sounds found in those dusty grooves. The basics of phonograph technology changed little from 1878, when Thomas Edison built his first record player, to the rise of the compact disc in the early 1990s: a needle, or stylus, moves through a circular groove carved into the surface of a spinning plastic disc, giving off vibrations that are converted into an audible electric signal. The traditional method for digitizing analog recordings involves a standard turntable, an analog-to-digital converter, and a CD burner. Results vary according to the equipment: armchair audiophiles can get in on the action for a few hundred dollars, but projects requiring archival-quality recordings—such as the Schulich School of Music’s ongoing quest to digitize its vast collection of Handel recordings (originally amassed by the late McGill alumnus David Edelberg, it’s the world’s most extensive Handel LP collection)—necessitate a decidedly larger investment. And that’s not the only catch. “Every time you place a phonograph needle on a record,” explains Ichiro Fujinaga, a DDMAL researcher and professsor in the Schulich School of Music, “the record gets damaged.” Damage from a single play may be negligible for pristine vinyl, but potentially catastrophic for a fragile disc that’s the only known copy of a specific recording. That’s why Fujinaga and his DDMAL co-researchers are exploring a radical alternative to the stylus: optically scanning an LP to create a precisely detailed 2D or 3D image of its surface. 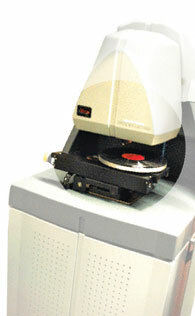 Using a white-light interferometry profiler—a $300,000 microscope usually reserved for industrial applications like quality control inspection of computer hard drives—they scan the unique widths and depths of an LP’s grooves. Fujinaga then uses software that simulates how a needle would traverse these virtual grooves, converting that movement into a digital waveform—which is transformed into audible sound, essentially “playing” the image. In addition to eliminating surface noise due to dirt or scratches, this non-invasive digitization method can be used to safely recover sound from worn, or even broken, records that would otherwise be unplayable. 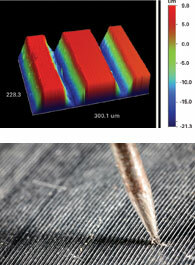 Researchers use a $300,000 microscope to scan an LP's grooves (above). The scan is then converted into a playable 3D computer image (top). The challenge now lies in improving the scanning time required per album. At the lowest resolution, it currently takes 10 days to scan one side of an LP (some 20 minutes of music); to scan the same side at the highest resolution would require five years. “It makes me appreciate the power of analog,” says Fujinaga, who moonlights as a musician in Arashi Daiko, a Montreal ensemble which performs the ancient Japanese drumming known as taiko. “That simple needle gets so much information—and it’s so much work to do the same thing digitally. Working with a network of sound recording engineers, pattern recognition experts and psychologists, Fujinaga and his co-researchers are trying to determine the minimal scanning resolution to achieve optimal audio quality. It all depends on how much we can really hear. The project isn’t just about the music, either. The DDMAL is also working on the problem of digitizing, and creating meaningful metadata for, album covers and the labels affixed to the centre of the records. It’s a daunting undertaking that will eventually offer musicologists the incredible boon of being able to rapidly search librettos, photos, publishing information and liner notes. “If we have over a million records to do, we’ll have to start soon,” Fujinaga says. “So now is the time to do the research on how we should do this properly. The Distributed Digital Music Archives and Libraries program receives funding from the Social Sciences and Humanities Research Council, the Canada Foundation for Innovation and the Daniel Langlois Foundation.